Read a few words about the author here. We are today faced with the greatest dilemma ever to confront humanity: our dependence on fossil-fuel powered economic growth. This dependence is gradually warming up the world and is obviously unsustainable, yet most people, including those in power, choose to ignore the problem, even though it could well lead to the deaths of millions and quite possibly the end of what we might call ‘civilization’. This book delves into the fundamental issues that have resulted in this dilemma, and examines potential solutions. It also explains why our economic system is no longer working. At the heart of the problem is the eternal conflict between self-interest and society, a conflict that all of us the world over must surely recognize in ourselves and all around us. Would we like to ensure that our grandchildren have a good chance of survival in this world? Yes, we would. Are we prepared to sacrifice some of our comforts and change the way we live? No, we aren’t (most of us, anyway). There is, of course, more to it than that, and the point of this book is to examine every aspect of the argument and to show why we need to change our economic system to ensure the survival of future generations. In the course of this investigation I demonstrate, with the use of historical data in chart form (a speciality of mine), how a few fundamental rules of economics are no longer being observed, and why this is leading to a disastrous build-up of debt, both economic and ecological. I show that over 60% of all real wealth in the world today has come from oil, and how a third of supposed wealth, as represented by money, doesn’t actually exist, because it’s based on credit that is itself a claim on future production – one of several related reasons why the rich world is getting poorer. 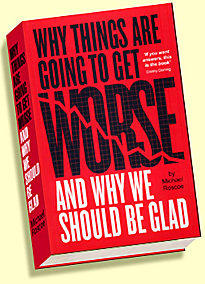 I also demonstrate how the financialization of the economy, in combination with digital technology and the rise of the internet, is killing jobs and feeding inequality, and that, contrary to the generally optimistic viewpoints of most economists and politicians, we can no longer expect new jobs to be created in place of those lost through ever-increasing productivity. You can read the preface and introduction to the book here. • Where does wealth come from? • What gives money its value? 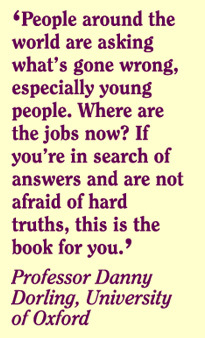 • Why are there so few decent jobs now? 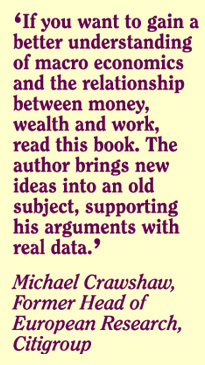 Although this book is primarily an investigation into wealth, work and values, it can also be read as a simple guide to macro-economics – the reader doesn’t need to have a prior understanding of economics. Take a look at the contents and themes, here. • Why are growth forecasts always too optimistic? • Why is the global economy still struggling? • What’s happening with oil?